The back-to-school season always triggers flashbacks—not entirely pleasant ones—to my own schoolboy days. Specifically, I’m reminded of those late August/early September treks to the local clothes-mart where my mother and I would engage in a battle of wills over my back-to-school wardrobe. The problem stemmed from the fact that my mother and I took very different approaches to the clothes I would ultimately wind up wearing. Whereas my mom’s criteria for judging clothes seemed a trifle nebulous to my way of thinking—“Well, this looks nice. And so inexpensive!”—I was, admittedly, a bit more particular; some might even say finicky. Only certain styles and fabrics could make the cut. Colors were a particular sore spot—this lighter shade of blue is acceptable, while this darker one is not. Is that a button-down collar? Are you mad, woman? And logos and pockets—those simply wouldn’t do. Now that I’m (theoretically) an adult and (even more theoretically) capable of buying my own clothes, my fussiness has apparently transferred itself over to laptop cases—only a particular type can satisfy my tortured mind. Here’s the criteria a carrying case must meet before I deem it worthy of transporting my MacBook Pro hither and yon. It had better be a backpack. It needs to have compartments for carrying around not just my laptop, but also my cellphone, iPod, loose change, and whatever other doodads I happen to need at a moment’s notice. And those compartments need to keep everything where I put it—nothing’s worse than opening up a backpack to discover that the bumps and turns of the open road have caused every item out of its carefully ordered place and into a common jumble. Even with all that electronica stored inside, I’d like the weight to be evenly distributed so that my shoulders don’t pop out of their respective sockets mid-journey. I prefer that it be black. Colorful accessories are for showgirls and 1970s illusionists. That’s an admittedly particular set of demands. So it’s hardly a surprise that I have a hard time finding a backpack that suits my purposes. After a backpack I had used for years of tortuous travel finally gave up the ghost this spring, I’ve given a growing progression of bags the Goldilocks treatment—this one’s too big; this one’s two small; this one’s too loose. The Convertible Laptop Backpack from Solo is the closest I’ve come to finding one that’s Just Right. The backpack is compact without feeling cramped. It offers a number of pockets and compartments for storing things without offering so many that you find yourself rummaging through the back trying to remember where you stashed something. And once you slip it over your shoulders and on your back, it fits fairly comfortably without causing undue strain. Of course, you don’t have to slip it on to your back at all—that’s where the “convertible” part of the name comes in. The backpack straps of the $80 Solo bag unclip with the press of three buttons, leaving you with a handheld case (which you carry by the straps that remain at the top of the bag). If you prefer a messenger bag, just attach the included adjustable shoulder strap. 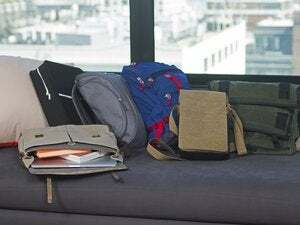 The nylon Convertible Laptop Backpack is 12-by-15.25-by-6-inches; an 11.25-by-14-by-2.25 laptop pocket inside the bag comfortably holds a 15-inch laptop. I count four separate zippered compartments—a small pouch in the front of the bag followed by a slighter larger pouch, then the section containing the laptop pocket and finally an area with an according fan file for folders and documents. There’s also a slit in the back of the backpack—in the part that goes up against your pack—that could be used for additional storage, especially if you convert the bag into a case or messenger bag. The slit is open at the top with a zipper on the bottom; unzip it, and I assume you can slip your bag over the handles of rollaway luggage, though I didn’t test this feature. Inside each compartment, you find an assortment of pockets, sleeves, and other containers for everything from papers to electronic gear. It’s here that the Convertible Laptop Backpack really shines. Everything that I need to store—print-outs, cables, power cords, iPods and cameras, even transit tickets—has a place. More important, it stays where I put it—nothing has fallen out in transit. The accordion fan file has kept papers from getting crumpled, and that’s after keeping them in the bag for days at a time. Here’s an example of Solo’s attention to detail when it comes to storage: Each of the front compartments feature sleeves for holding pens or pencils. I can’t tell you how many times I’ve thrown a pen into one of my backpacks, only to never see it again. With a dedicated slot for holding a pen, I never have to fear that they’ll disappear into whatever Bermuda Triangle-like anomaly finds a home inside my backpacks. I mentioned that the Convertible Laptop Backpack is compact—I was able to stow it under the seat in front of me on a recent plane trip, and I still had plenty of room to stretch out my legs. A bulkier backup would have taken up most, if not all, of that storage space. But there’s a price to be paid for that compactness—the backpack straps are very tight, so the backpack doesn’t slip into place with the greatest of ease. Since I’m not exactly what you would call “slender,” I have to do a little bit of twisting and turning to slip in my right arm after I’ve gotten the strap over my left shoulder. Occasionally, the force of my wiggling causes the right backpack strap to pop loose from its clickable latch. It’s easy enough to click things back into place, but it can be a more than a little annoying. Another minor concern is the protection afforded my laptop when it’s inside the Convertible Laptop Backpack. The bag’s padded laptop pocket is cushioned, though not as much on the bottom as I’d prefer. Indeed, a quick comparison to other bags around the office found that those offer considerably more cushioning on the bottom than the Solo model. (And if you absent-mindedly slip your laptop into a part of the bag other than the laptop pocket, there’s even less padding.) My MacBook Pro is probably well protected—provided I’ve stashed it in the right sleeve—but a little more cushioning would eliminate this gripe entirely. These are minor complaints, however. The mobile user with a lots of things to keep organized and not a lot of patience for bulky, cluttered backpacks will certainly appreciate Solo’s Convertible Laptop Backpack—if you like flexibility in your carrying cases, it’s an even better choice. At any rate, if you’re as demanding as I am when it comes to laptop carrying cases, here’s one that’s up to the challenge of meeting many of those demands.